When we are traveling there are not a lot of sports moments to be had. Trying to balance an itinerary with 6 to 9 stops per day makes it difficult to “suit up” for a special game. That doesn’t mean we haven’t found ways to satisfy our competitive sides. 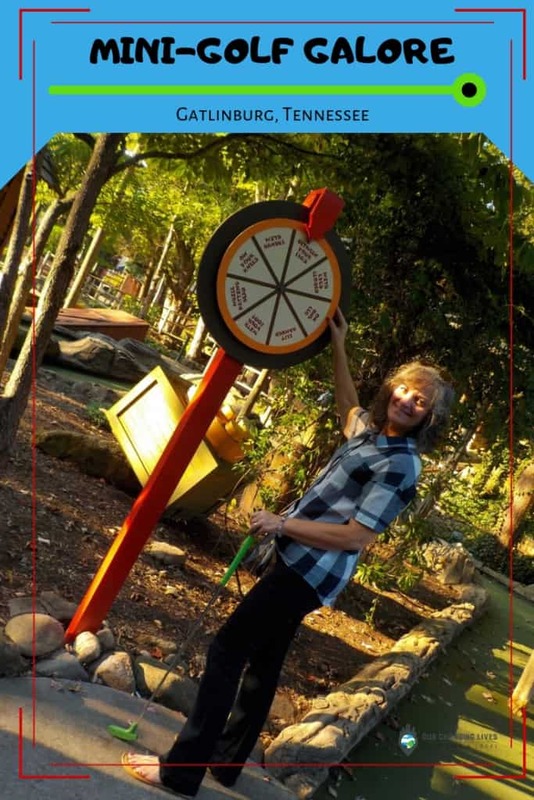 Miniature golf is always on our radar, when visiting a new destination. While it has become less commonplace than a couple of decades ago, hitting up tourist areas will usually allow for a game or two. 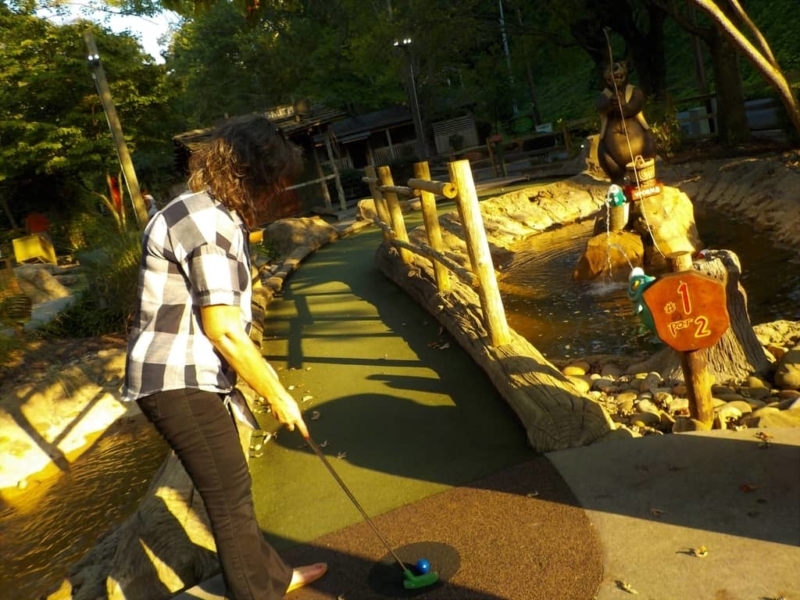 We found mini-golf galore in Gatlinburg, Tennessee, which allowed us to test our skills on a variety of courses. We visited Gatlinburg in the Fall, which meant that the weather pattern was a little active. On a day that brought sunshine, we headed over to Ripley’s Davy Crockett course for a hillside challenge. There are two themed courses to choose from, so we went with the one that had the least golfers. Built on a small hillside, there were some stairs to traverse, but not too many. 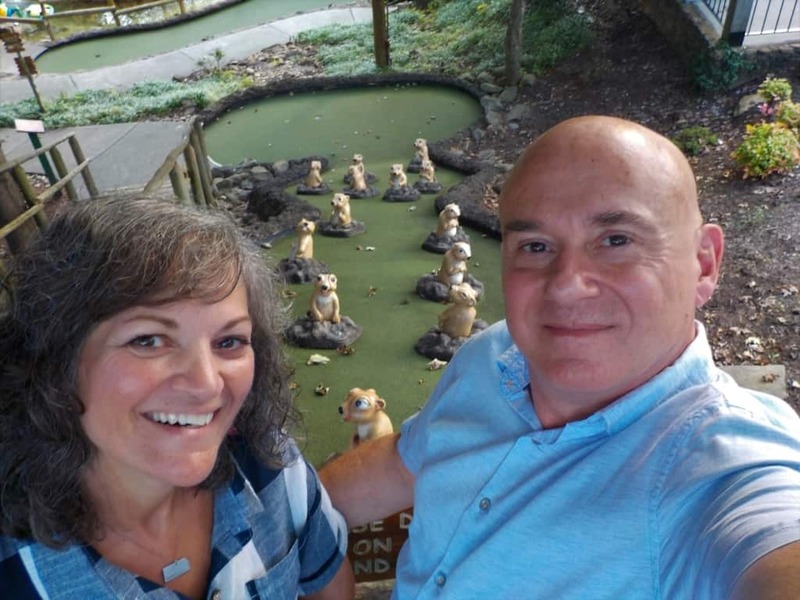 Our mini-golf galore tour started with an added twist. Some of the holes have a spinner that identifies an unusual approach to play. Of course, this isn’t required, but it does make for a few extra smiles and giggles. Just imagine trying to use the putter when on your knees. It’s not as easy as one would think. While Ripley’s had a hillside, down the road we found a mountainside course. 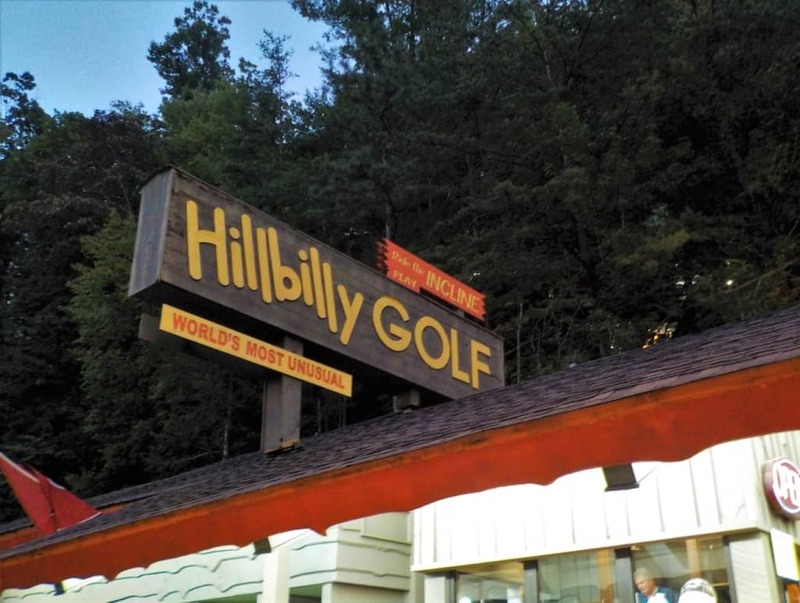 Hillbilly Golf was suggested by one of our friends, and we couldn’t wait to experience it. To be honest with you, we actually played this course the same day as the Davy Crockett one. When the drizzle stops, you take advantage of every minute. At Hillbilly Golf you climb into an incline train, which hoists you to the top of the hill. Tucked away in the tree cover is one of the most unusual courses we have played. We began our game at the top, and the course is laid out to lead you down the mountainside. Along the way we found lots of nostalgic artifacts that would have been commonplace in many mountain homes and farms. Some city dwellers may be puzzled by these pieces, but a visit to a local museum will usually help clear up their use. As the evening sky darkened, we enjoyed the peaceful atmosphere of this place. It was certainly unlike any course we have experienced. While the outdoor courses were a little farther off the downtown strip, this didn’t mean that mini-golf can’t be found closer in. There were a couple of evenings that we found ourselves ducking out of passing showers. The strip has plenty of shops for this, but we also discovered mini-golf galore in this area as well. 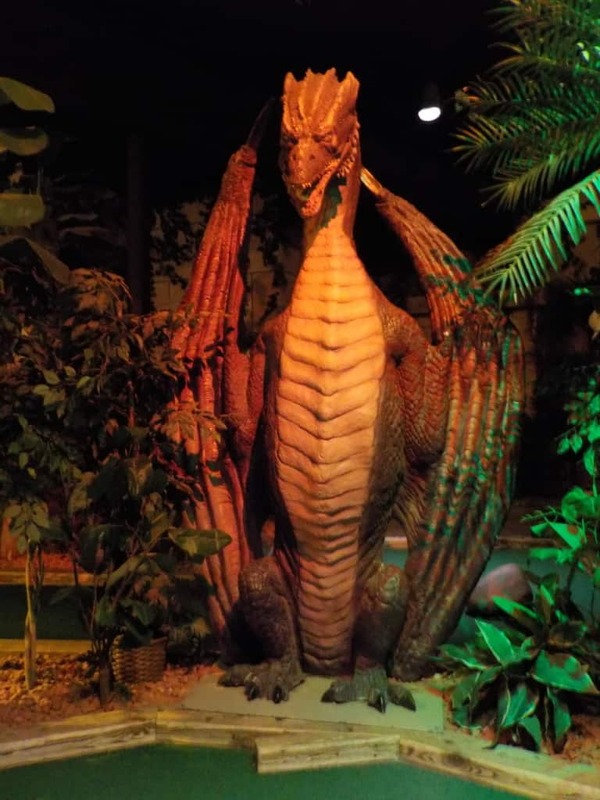 Treasure Quest Mini-Golf whisked us away to some of our favorite movie sets. This indoor course allowed us to entertain ourselves, while staying high and dry out of the rain. As we made our way through the space, we saw plenty of notable characters. The course isn’t too challenging, but we have found ways to add fun to each place we play. Be sure to check out all of their props, as they were actually very inventive with their decor. Okay, that was a pretty corny subtitle, but it made me smile. 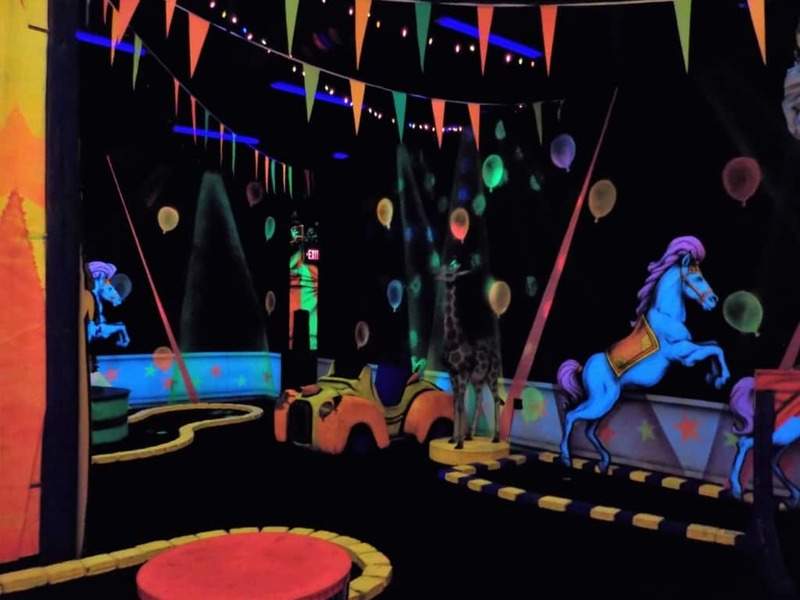 Speaking of corny, have you ever played mini-golf under black-light conditions? A stop at Circus Golf had us doing just that. This place actually had a combination of attractions, which had us making a return stop. Their mirror maze didn’t sound that appealing to us, but we did enjoy a round of their Shoot Em’ Up Cinema. This was another chance to pit our skills against each other, but in a shooting gallery setting. Most of our selfies are a little more run-of-the-mill. We are usually trying to focus on the site we are visiting, but we thought we’d toss in a couple of the ones we take for ourselves. Life is about having a good time and sharing a few laughs. 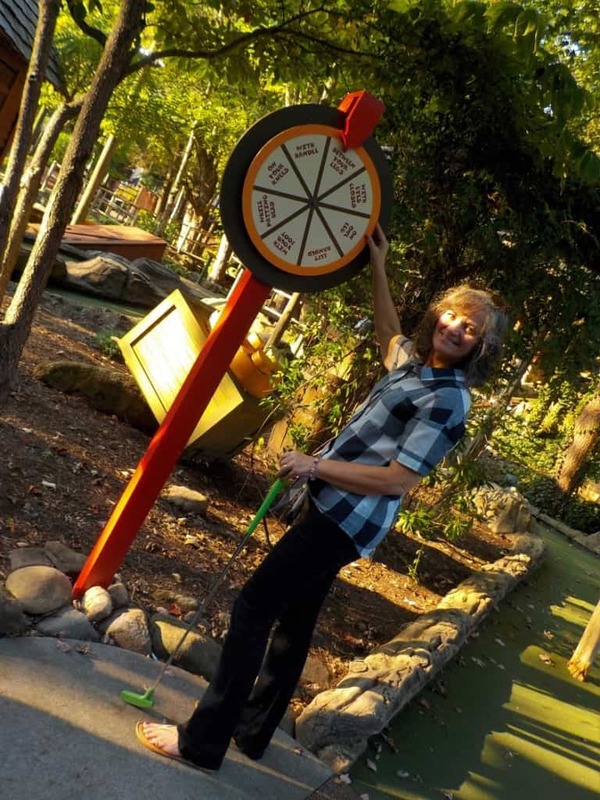 Sure, there are times to be serious, but not during mini-golf. Here we are playing for fun and bragging rights. Who wouldn’t be surprised to find these terrifying creatures all around you during a friendly game? 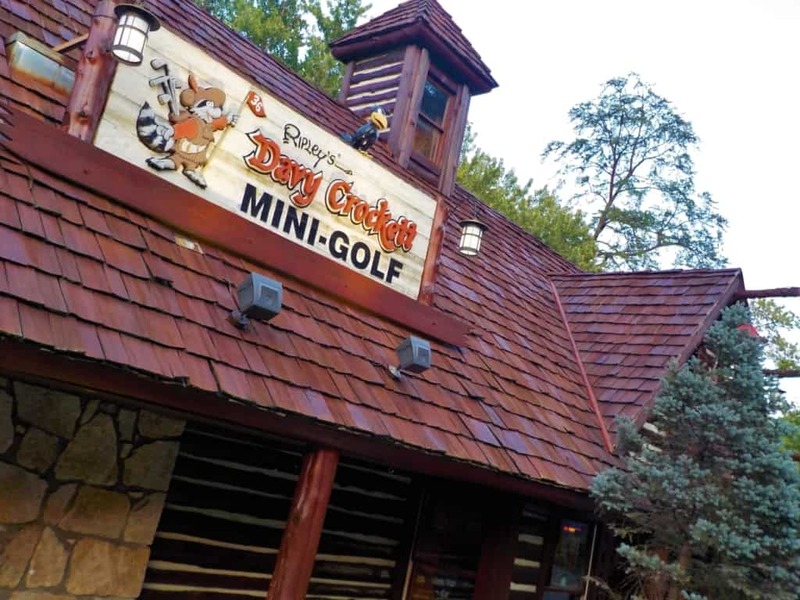 It’s easy to see that you can find Mini-Golf Galore in Gatlinburg, so why not add in a game or two during your next Smoky Mountain vacation? The nearby mountains make a wonderful backdrop for a semi-competitive challenge. You’ll get some fresh air and possibly make a few new friends. (Maybe even a mountain full.) This family friendly activity can get expensive, when you add in a group. You will definitely want to check out some of the shops around town for their visitor’s flyers. These are packed with coupons and discounts for many of the attractions along the strip. After all, the games are even more fun when you save a little money to play them. Share this article with a golfing buddy!